There is really not much to say here other than this is simple, quick, and absolutely delicious. Perfect for a quick weeknight meal, yet classic and decadent enough for weekend entertaining. Serve it with a small salad and some crusty bread and you have yourself a wonderful meal. In a medium sauté pan, heat the oil over medium high heat. Add the diced pancetta and cook, stirring frequently until it is brown and crisp, about 5 minutes. Using a slotted spoon, transfer the pancetta to a paper towel lined plate to drain. Bring a large pot of salted water to a boil. Add the pasta and cook according to the manufacturer's direction. Meanwhile, in a large bowl, mix together the eggs and cheese. Reserve 1 cup of the pasta water. Drain the pasta and immediately add it to the egg mixture along with the pancetta, tossing to coat the pasta with the sauce. Add 1/2 cup of the reserved pasta water and toss to coat. Add additional pasta water if needed to reach desired consistency. Season with salt and freshly ground black pepper. Serve with a garnish of chopped fresh parsley and additional Parmigiano Reggiano grated cheese. Enjoy! I'm a huge Carbonara fan. 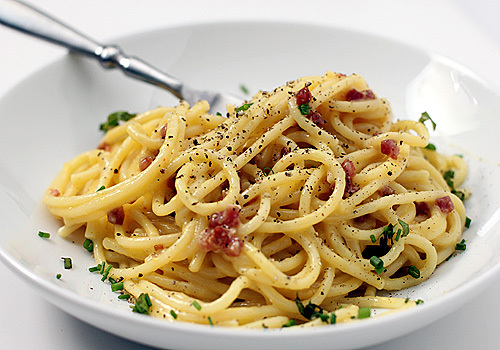 Thanks for drooling and stopping by:) I am not Italian, but from what I know cream in Carbonara is a no-no. It's all about the cheese, eggs, pancetta or guanciale. Pasta Carbonara is maybe my favorite kind of pasta. It's silky and smoky and dreamy and it reminds me of the time I spent in Italy in college! I also think it's a dish that everybody loves, so it's perfect for a dinner party. Since you lived in Italy I am sure you have had countless versions of the "real" dish. Every home has their own. I agree with you that it is perfect for entertaining--easy and elegant. Thanks for stopping by! Just as I love it - no need for nasty cream, just deliciousness from the pasta, pancetta, egg yolks and gloriously good hard cheeses. Adding some freshly chopped flat leaf parsley is new to me, and has a possibly delicious flavour feel. Happy Cooking throughtout 2011, michelle in Wellington, New Zealand. I was looking for a TRUE Carbonara recipe and ran across yours. I made it tonight for my son, his girlfriend and her mother (who I was meeting for the first time!). It is PERFECT! SOOO wonderful! Thank you! I tried to make this, exactly as instructed but mine didn't turn out so great. I started to get scrambled eggs then I added a little more water so it thinned it out ok. The egg mixture I started with was a little thick and I had correct amounts. Not sure what I did wrong. I'll try it again. Sorry it didn't work out for you. I have never had the egg yolks and cheese mixture set when tossing with the pasta. Tossing immediately and constantly is important. I do hope you give it another go.